Keep your pool or spa sparkling clean the quick and easy way - no cumbersome cords or hoses required! 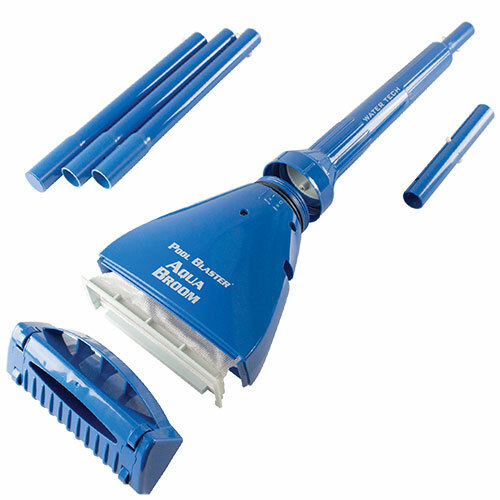 With a Pool Blaster Aqua Broom XL Ultra, you'll never dread cleaning your pool or spa again. The simple, easy-to-use design features enhanced suction technology that picks up sand, silt and leaves with little effort. No wand-type spa cleaner has power like that! Plus, it has a large head to reduce cleaning time and works in as little as 5.5" of water. Also features cordless battery-powered design, high-capacity debris chamber, easy-grip handle for step, stair and surface cleaning, built-in wheels and more. Filter and mircofilter bags and 3-pc. pole included. Requires 5 'D' batteries.